When you were a kid and someone asked what kind of dog you had, did you ever answer “a Heinz 57 mutt”? Where did that term come from? That term is a shortened form of an advertising slogan about the numerous products, or “57 varieties”, produced by the Heinz Company. And, today it means anything that is mixed from a lot of things. 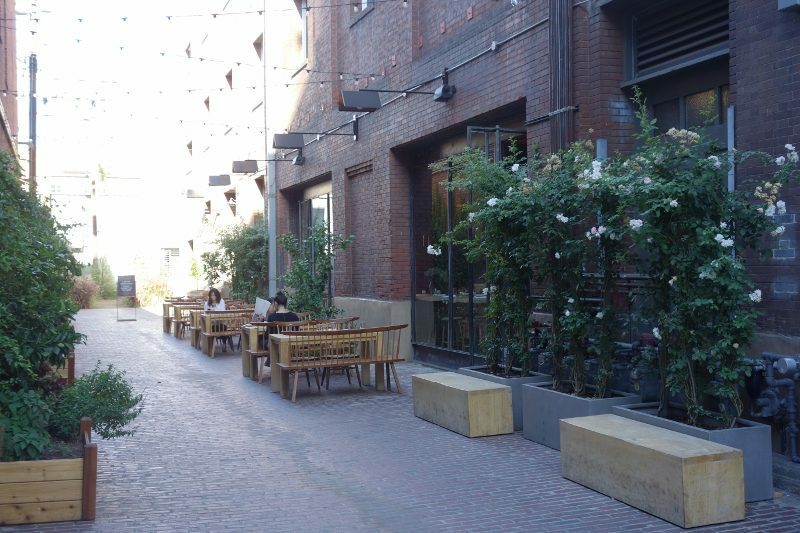 LA’s newest downtown restaurant in the arts district is located on the former loading dock of the Heinz 57 Factory and is called Fifty Seven. But, while the name may pay homage to its former tenant, it is actually quite appropriate considering the format. Fifty Seven boasts a rotating roster of “chefs in residence” who will come in for a season and create their own seasonal menu. 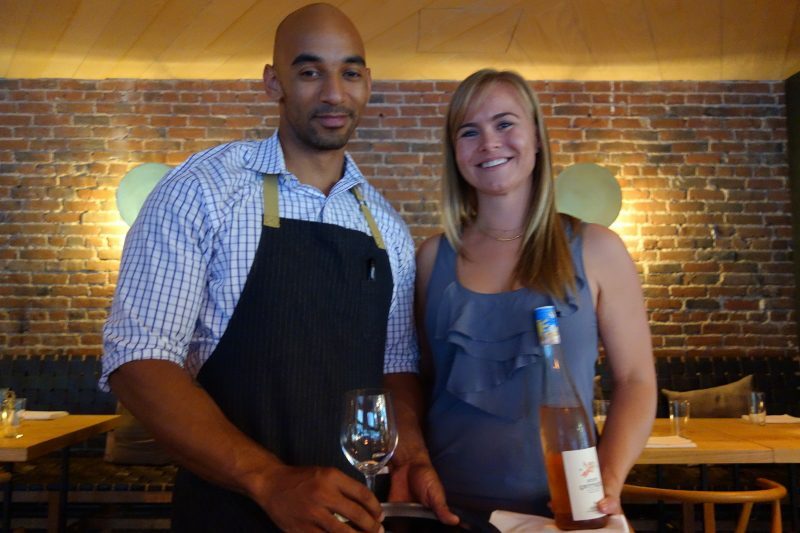 The current “chef in residence” is James Beard Award nominee Josh Drew who has worked at Farmshop, Bouchon and Quince. While Josh is working on a restaurant idea that he plans to in the near future, he is spending the next four months at Fifty Seven. The seasonal menu highlights fish and shellfish and the menu is divided into 5 sections: To Share, From the Market, Cheese, Meat and Fish and To Finish. We sat down and were greeted by Wine Director Michael Nemcik and Sommelier Wendy Shoemaker. With an eclectic wine list that is constantly evolving, what I loved about the wine list was that most options were available by the glass or carafe. This makes it really easy to enjoy different wines throughout the dinner and so we told Michael and Wendy to surprise us. From Champagne to Rose from Austria to Sancerre to a Pinot Grigio with skin contact, they did an amazing job pairing wines with our dishes! 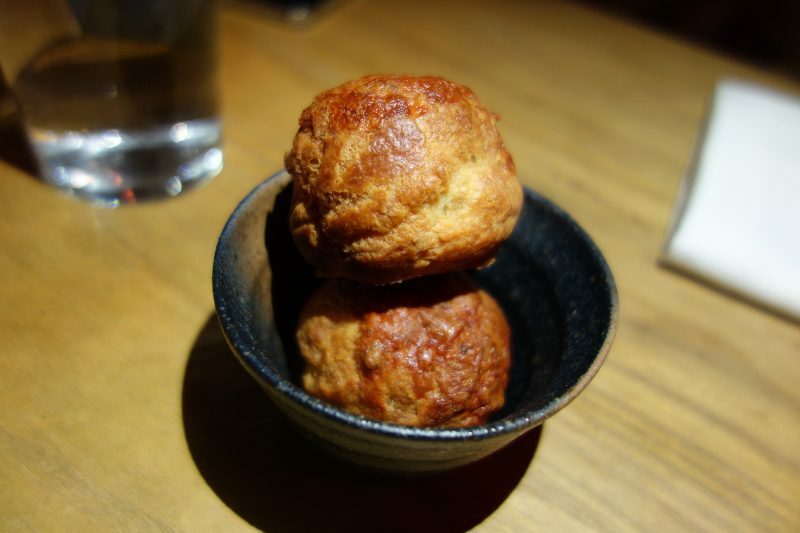 As we reviewed the menu, the kitchen sent out some Cheese Puffs. Light and fluffy, we knew we were off to a great start. 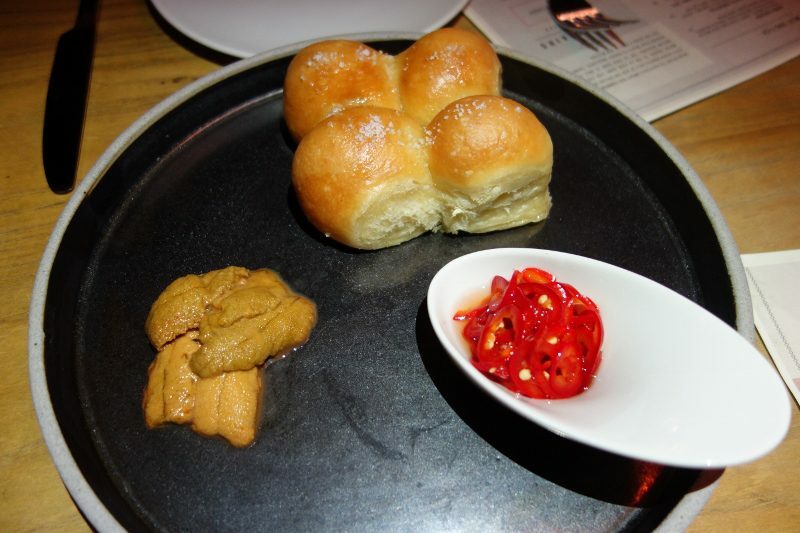 Parker House Rolls with Santa Barbara Sea Urchin, Chiles, Local Honey – The sea urchin was delicate and sweet and the honey and chiles added just a little sweet heat. 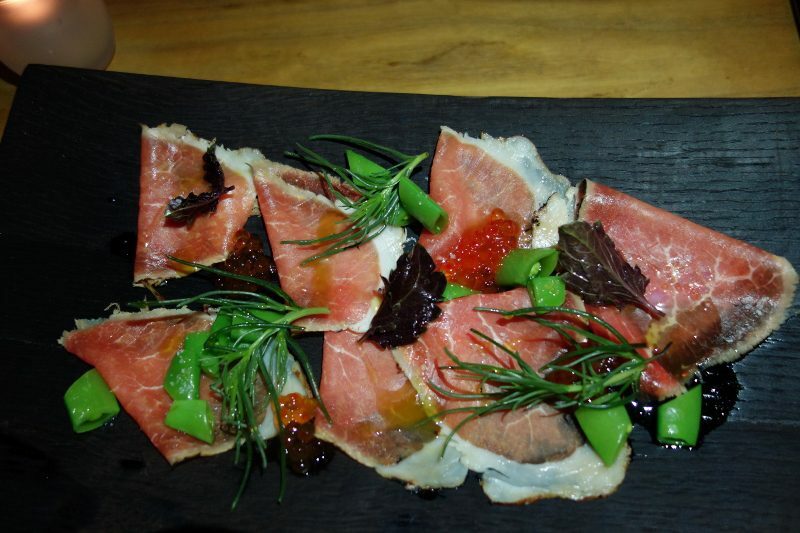 Salt & Sugar Cured Beef with Smoked Trout Roe, Sugar Snap Peas, Thai Basil, Agretti – We absolutely loved this dish. There were so many flavors and textures going on, from the crisp peas to the crunchy agretti, but they all worked so well together. Wild Spot Prawns with buttermilk, grilled black kale pesto – These may be the most tender spot prawns I have ever had. The meat melted in our mouths. Local Squid Braised in Ink with braised golden beet greens, green garlic aioli, puffed buckwheat – This is an amazing dish. The squid is perfectly cooked – tender with a little crunch but the puffed buckwheat added an extra layer of texture and crunch. 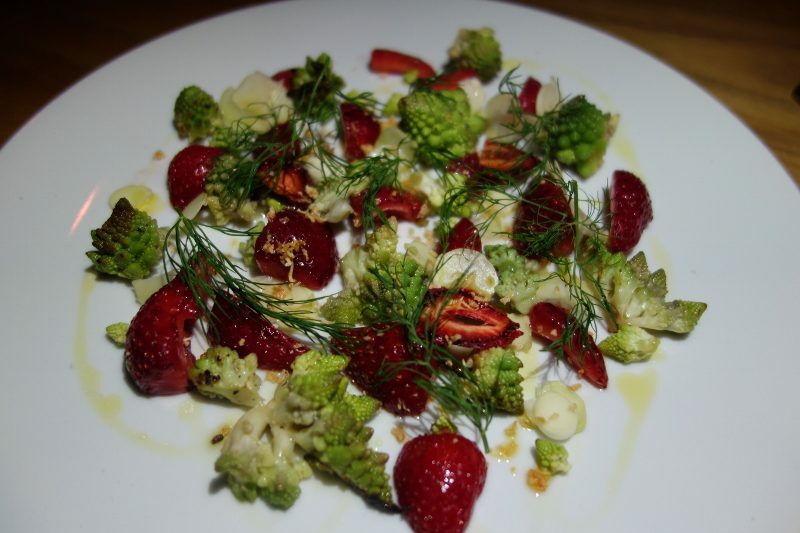 Albion Strawberries from Rutiz Farm with romanesco cauliflower, dill, horseradish – Never would we have though to put these ingredients together but oddly, it worked. 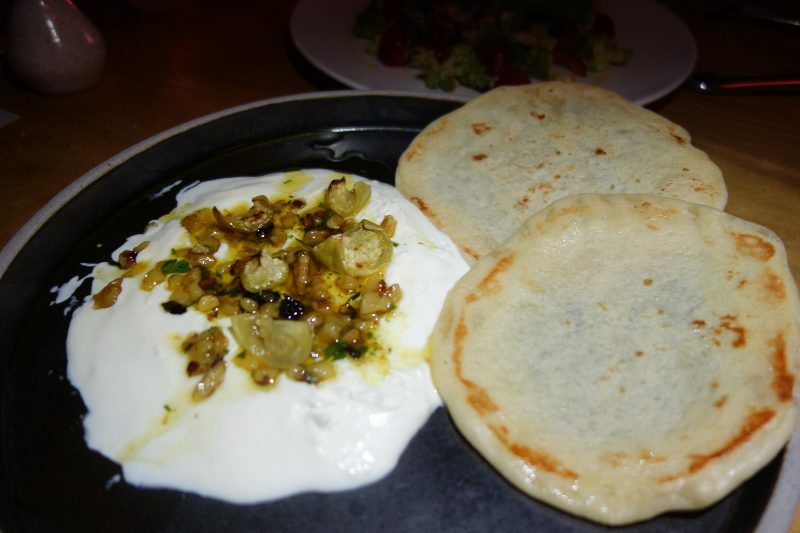 Whipped Goat Cheese from Drake Family Farm with walnut-black garlic pesto, tomatillo, flatbread – What’s not to love about whipped goat cheese!?!? Like the other dishes, the freshness of this dish had us licking the plate clean and wanting more. While we skipped the Cheese and Meat and Fish sections, we couldn’t skip dessert. My dining guest for the evening was Marisa Churchill, a pastry chef and author of Sweet & Skinny. I would say that it’s a very good sign when one pastry chef compliments another’s dessert and Marisa was very impressed with our dessert choice. 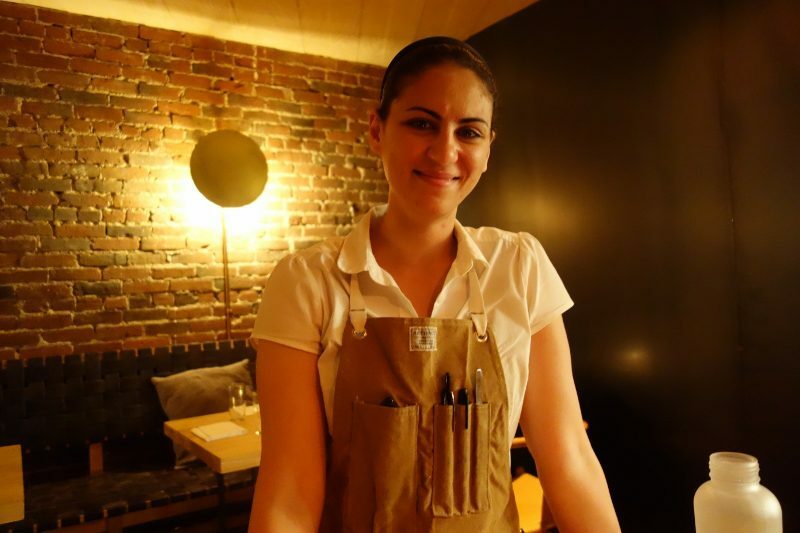 Pastry Chef Sahar Shomali is quite a talent and I can’t to try more of her desserts. 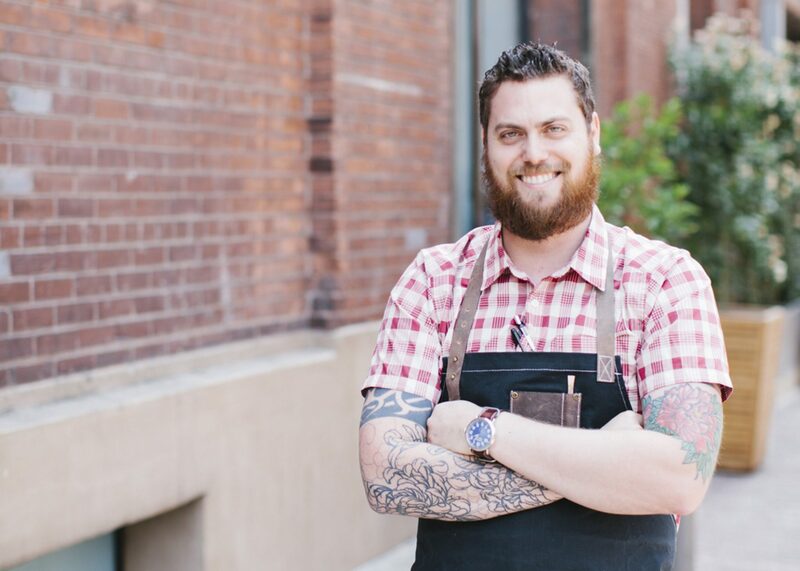 Head down to Fifty Seven to enjoy Josh Drew’s menu….but in a couple months he will move on and a new chef and new menu will be in place. Looking forward to what comes next! This entry was posted in Food, Wine and tagged downtown LA, Fifty Seven, food, Heinz 57, Josh Drew, Los Angeles’ Arts District, Michael Nemcik, Sahar Shomali, Wendy Shoemaker, Wine by Allison Levine.